The quaisten is rhetorical, impleein "thase places whaur my hameland lees". Code 42 wis shared wi Slovakie till 1997. 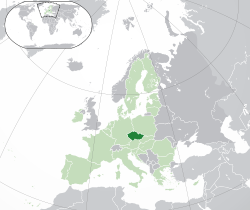 The Czech Republic (Czech: Česká republika), Czechie (Czech: Česko, o Czechland) is a laundlockit kintra in Central Europe an is a member o the European Union. It haes a laund mairch wi Poland in the Nor-East, Germany in the Nor-Wast, Austrick in the sooth an Slovakie in the east. Its caipital ceety is Prague (Czech: Praha) is a weel-faured destination o tourists. It haes a population o ower 10,400,000 indwallers. ↑ Ceetizens alangin tae minorities, that tradeetionally an on a lang-term basis leeve athin the territory o the Czech Republic, enjoy the richt tae uise thair leid in communication wi authorities an in coorts o law (for the leet o recognised minorities see Naitional Minorities Policy o the Govrenment o the Czech Republic, Beloroushie an Vietnamese syne 4 Julie 2013, see Česko má nové oficiální národnostní menšiny. Vietnamce a Bělorusy). Airticle 25 o the Czech Chairter o Fundamental Richts an Basic Freedoms ensurs the richt o the naitional an ethnic minorities tae eddication an communication wi the authorities in their awn leid. Act No. 500/2004 Coll. (The Administrative Rule) in its paragraph 16 (4) (Procedural Language) ensurs that a ceetizen o the Czech Republic wha alangs tae a naitional or an ethnic minority, that tradeetionally an on a lang-term basis leeves athin the territory o the Czech Republic, haes the richt tae address an admeenistrative augency an proceed afore it in the leid o the minority. If the admeenistrative agency haes na employee wi knawledge o the leid, the augency is boond tae obteen a translator at the augency's awn expense. Accordin tae Act No. 273/2001 (Concernin the Richts o Members o Minorities) paragraph 9 (The richt tae uise leid o a naitional minority in dealin wi authorities an in front o the coorts o law) the same an aa applees tae members o naitional minorities in the coorts o law. ↑ 4.0 4.1 "Czech Republic Population 2014". World Population Review. Retrieved 7 January 2017. ↑ Census of Population and Housing 2011: Basic final results. Czech Statistical Office Archived 29 Januar 2011[Date mismatch] at the Wayback Machine.. Retrieved on 19 December 2012. ↑ "Gini coefficient of equivalised disposable income (source: SILC)". Eurostat Data Explorer. Archived frae the oreeginal on 16 April 2010. Retrieved 22 November 2016. This page wis last eeditit on 30 August 2017, at 03:21.